Travel the Universe and learn about space exploration without leaving Earth. 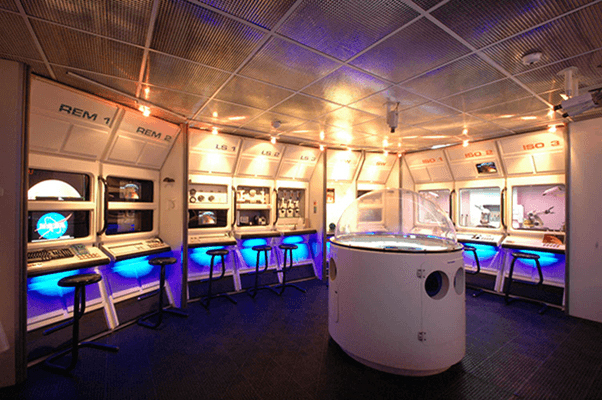 Challenger Learning Center, located at the Academy @ Shawnee, offers space mission simulations that give students the chance to experience space travel first-hand. Students work in teams to solve real-world problems and practice the skills utilized by the astronauts, scientists, and engineers who ensure each space mission’s success. Work as a team to land on the Martian surface and seek out evidence of life and water while locating missing satellites and checking radiation levels. Your mission: land on the Martian surface to seek out evidence of life and water. Working closely as a team, your students will reprogram communications satellites, calculate and plot a course to Mars, test soil, and examine Martian rocks using robotic arms, monitor the health of the crew, locate missing satellites, and check radiation levels. It’s 2025, and your team of astronauts must work together to establish a permanent lunar base while avoiding meteor showers and other hazards. It’s the year 2025. For the first time since the last Apollo mission in 1972, humans returns to the Moon. This time, the goal is to establish a permanent lunar base, from which to make lunar observations, study the feasibility for developing a self-sustaining lunar base, and create a stepping stone for human planetary exploration. Supported by a team back on Earth, astronauts construct and launch a probe to the lunar surface and select a site for establishing a permanent Moon base – all while avoiding meteor showers, chemical leaks, and other hazards. Assemble and launch a probe to study Comet Encke as it approaches Earth’s orbit. In the not-too-distant future, Comet Encke is approaching Earth’s orbit. In order to study the comet, your crew of astronauts must assemble and launch a probe. Along the way, your team will use their scientific, problem-solving, and decision-making skills to deal with unexpected and unpredictable obstacles!